The eighth Stirling International students' golf tournament came to a dramatic conclusion with a play-off needed to separate Ronan Mullarney (Maynooth) and James Glenn (Durham) after an intriguing final day on the Torrance Course at Fairmont St Andrews. Mullarney won the men's title on the first extra hole. With Glenn and Mullarney playing together, along with Mark Napier (Stirling), in the final group, it was the American Glenn who made early progress. Leading by one from Napier and three from Mullarney (pictured right). Four birdies over the first nine holes stretched his lead as Napier’s three birdies were offset by an equal number of bogeys. Mullarney, meanwhile, had made three birdies of his own to move into second place, although still four shots back from Glenn. When Mullarney bogeyed 15, it seemed that the contest was all but over, Napier having already dropped two shots while Glenn was a picture of consistency with six straight pars. However, on the 17th Mullarney made birdie for the first time this week while Glenn could only manage a double bogey 5. This cut the lead to one heading up the last. Once again, Mullarney stepped up to make birdie, and Glenn’s par meant a play-off. 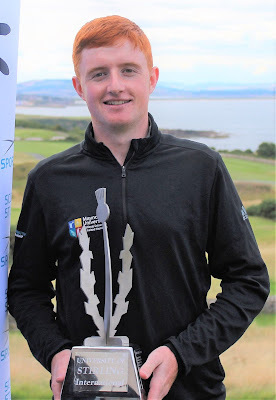 Completing the podium 1-2-3 was Caolan Rafferty (Maynooth), sneaking ahead of Scott Macpherson (Stirling) on countback. This strong finish from Maynooth saw them crowned team champions for the first time, with a three-round total of 10 under par, 13 strokes better than Stirling I. In the women’s competition, Nicola Slater (Stirling), pictured right, cruised to victory after her incredible opening two rounds had given her a solid cushion going into the final day. An up and down third round saw her gain an eagle and three birdies, along with eight dropped shots, for a final total of 12-under-par 210. 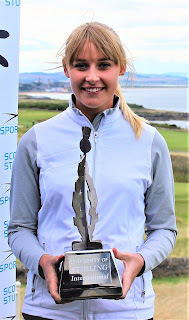 Penelope Brown (Stirling) ended up Slater’s closest competitor, a final round 73 leaving her at -3 for the competition. She was run close, however, by Kirsten Brown (St Andrews) student with the round of the day, a 70, leaving her one short of second place. In the women's team competition, Stirling I took the victory, Slater and Brown combining with Rachel Thompson to finish at -16, 8 strokes ahead of St Andrews I.